Spanish Study - now also with blank tablature below the staff for guitarists learning to read treble clef! This piece is based on a very famous classical guitar piece, "Asturias" by Isaac Albeniz. In spite of being a greatly simplified version of Asturias, even to being set in a different key (the original is high up the neck of the guitar), this piece makes a satisfying and exciting first solo for students wanting to start classical guitar. It sounds more difficult than it really is. On this page are 5 versions of Spanish Study. 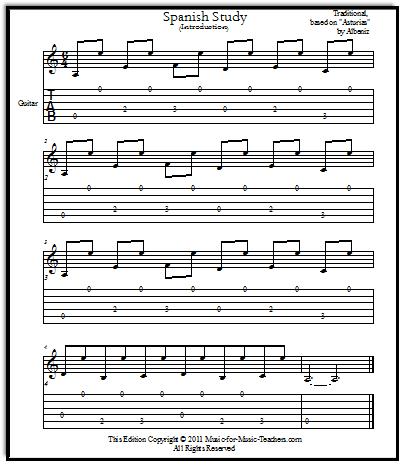 The first arrangement is a study or homework version, so my beginners can figure out the tablature and get more familiar with regular notereading. Spanish Study starts with only right hand thumb (p) and middle finger (m), taking turns. Notice where the music changes into triplets (the 3-note groups with a "3" over the top of the beam). The left hand "2" will be placed on "A," the 2nd fret of the "G" string, and stay there for the remainder of the piece. 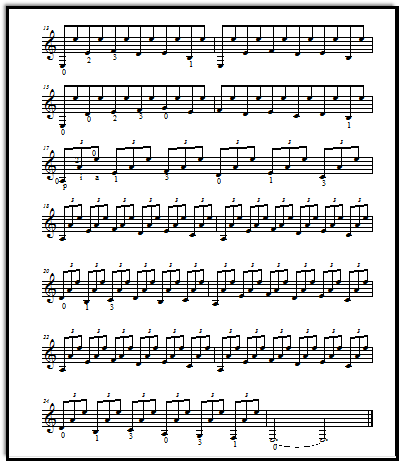 If you are not familiar with reading staff notation, listen to one of the videos on this page (not Asturias, but Spanish Study, below) and notice where the rhythm changes from a feeling of "1-2, 1-2, 1-2, 1-2, 1-2, 1-2," to a feeling of "1-2-3, 1-2-3, 1-2-3, 1-2-3, 1-2-3, 1-2-3." 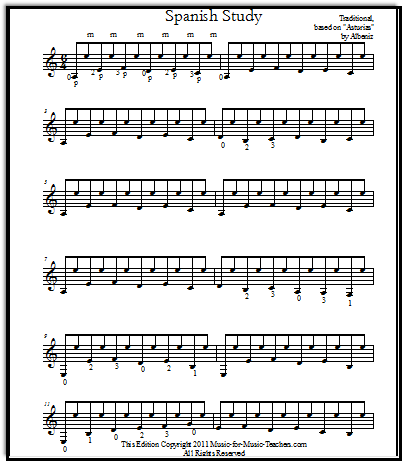 A good way to practice this study is to leave off the high E (string 1) and play the thumb melody alone. 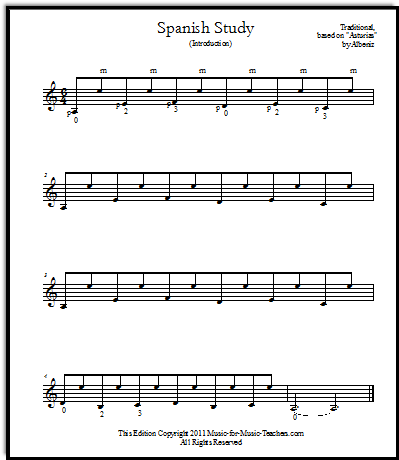 This is very helpful for struggling note-readers. "Open E, F (fret one), F sharp (fret two), G, G sharp, A. Next string: open A, A sharp, B, C, C sharp, D... Next string: open D, etc." I like to do this next to a piano so kids can see that there are no black notes between B and C, and E and F. Otherwise we use a paper keyboard. Unless they understand that the distance between notes is not always the same, they will always be baffled by note-reading on the guitar. 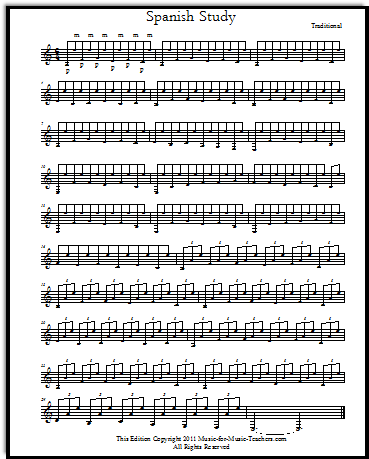 The two-page version below is just the same, but it has finger markings on more measures and large notes to make it easy to see! Be careful not to mistake finger numbers (1, 2, 3) for fret numbers -- sometimes they are the same, but not necessarily! Notice in measure 9 that the B is fingered with a 1, even though it is a 2nd-fret note; this is to facilitate playing, as the 2nd finger just played an E (and should stay there through the next measure). "0", of course, means open string. Just before measure 17, the left hand plays the B with a "1" finger again, because in measure 17 finger "2" must quickly snap down on an A. In the second half of the piece, some of the notes are fingered differently than in the first half, because the "2" finger is busy keeping the "A" note pressed down on the G string for the entire second half. Keep it pressed down! In measure 20, we meet a B note again, once again fingered with a "1" even though the C in the next fret is fingered with a 3. For kids breaking into classical guitar, going "cold turkey" off of tablature may be very scary. I like to help them out with just the first few measures written in tab along with standard notation. After playing entirely through this lovely piece, you can figure out why it is called a "study" or "etude" - all the right hand fingers get their turn to be part of a pattern, and it is tiring until your hand builds up strength. Don't overdo it at first! I mean it - you must be cautious with the small muscles of your arms and fingers. Thank you for a most excellent site. I am a classical guitar teacher, who endeavors to cover chords and fingerstyle as well. I especially liked the printable Celtic music, as some of my teenage students enjoy it! Thank you, again.